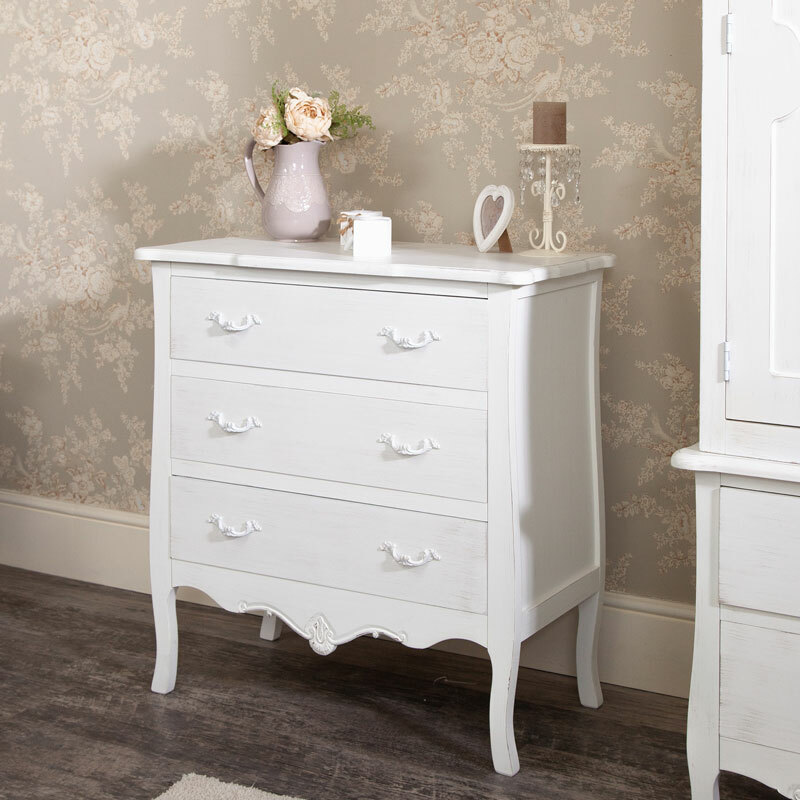 This 3 drawer white chest of drawers would make excellent storage or bedroom furniture for anyone who like vintage or shabby chic style furniture. Ideal furniture for a bedroom, hallway or living room area. 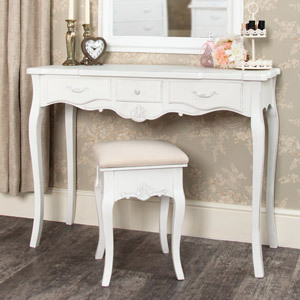 Whether your trying to recreate a romantic apartment in Paris or a vintage country cottage, this furniture will give you everything you need. 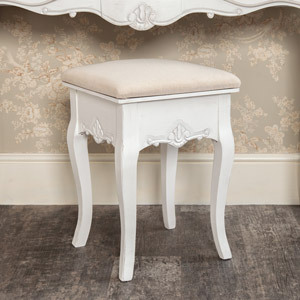 The vintage white hand finished drawers have a brushed distressed effect giving them a look of timeless age and subtle imperfection both amplifying the French appearance The cabriole effect legs are met with a simple ornate carving underneath the bottom drawer which along with the ornate painted metal handles really will bring a touch of shabby chic into your home. 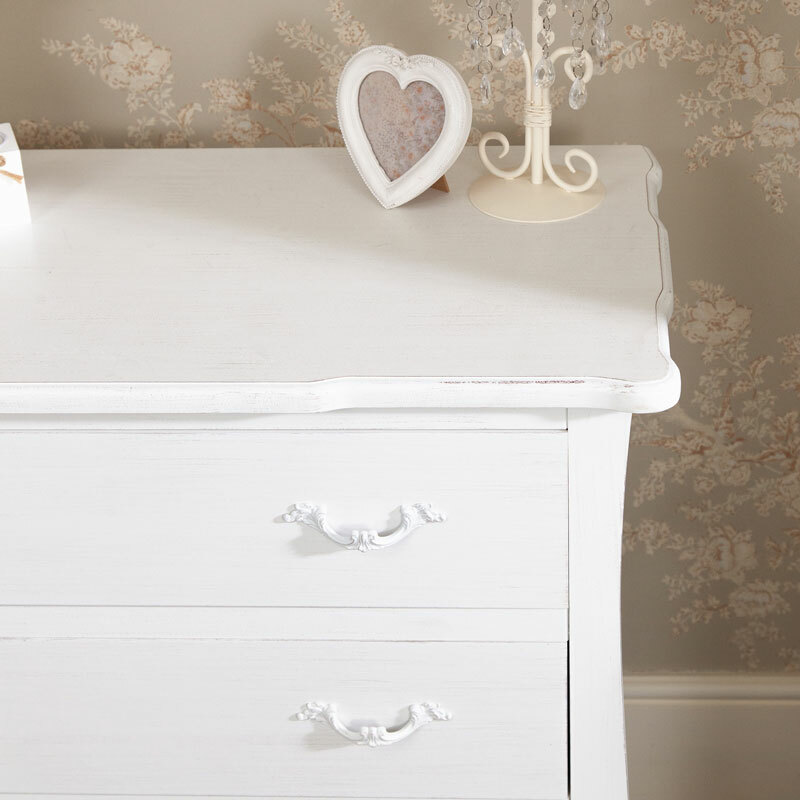 This 3 drawer white chest of drawers would make excellent storage or bedroom furniture for anyone who like vintage or shabby chic style furniture. 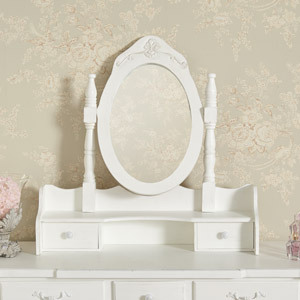 Ideal furniture for a bedroom, hallway or living room area. 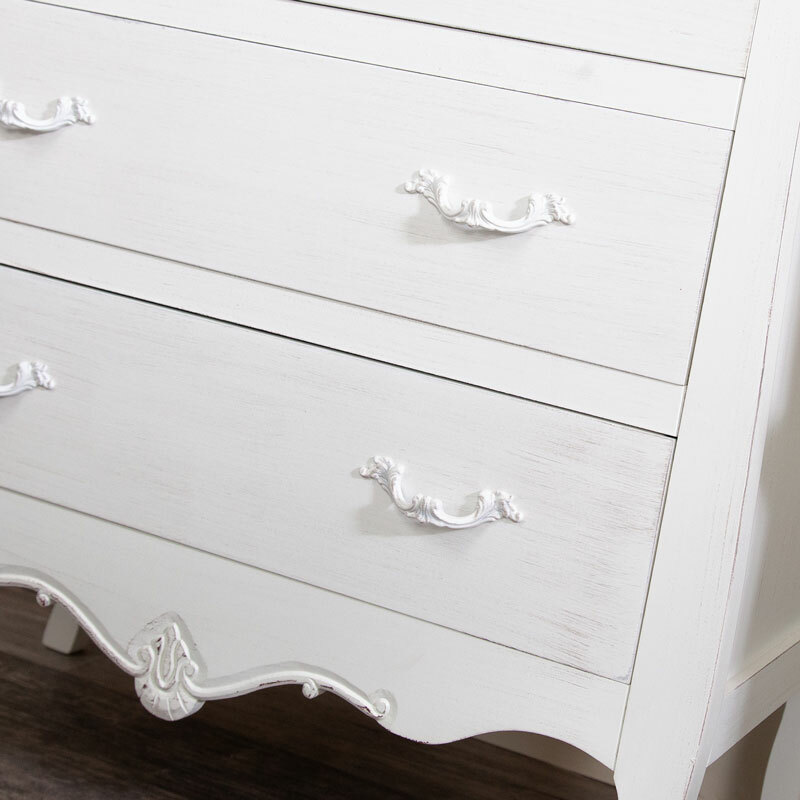 The cabriole effect legs are met with a simple ornate carving underneath the bottom drawer which along with the ornate painted metal handles really will bring a touch of shabby chic into your home. 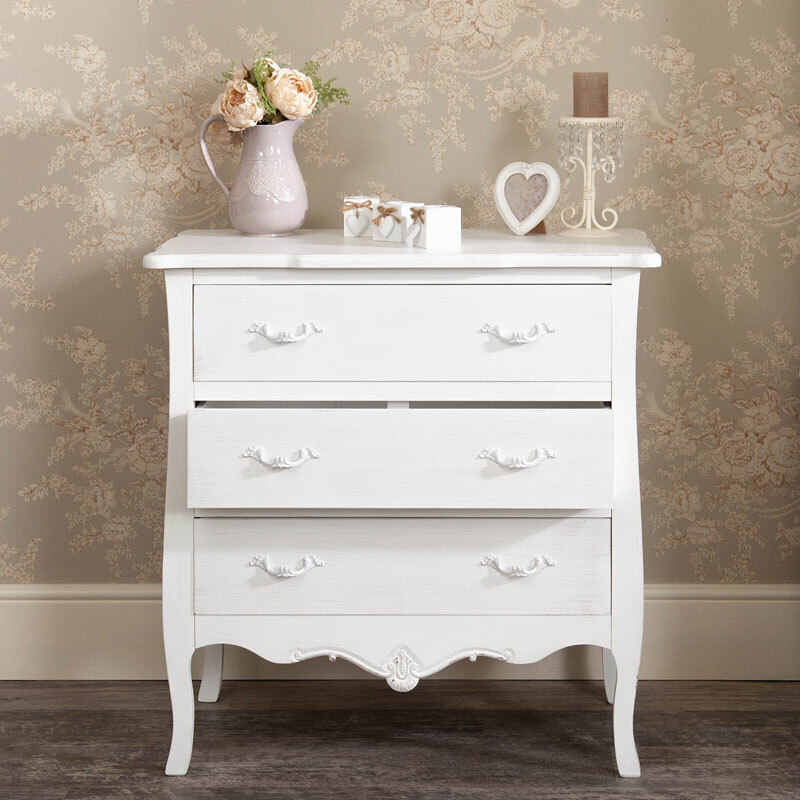 The chest of drawers is painted in a white finish with a distressed effect and comes fully assembled. The inner height of the 3 spacious drawers is 14cm, offering plenty of space for clothes, accessories or what ever you wish to store. 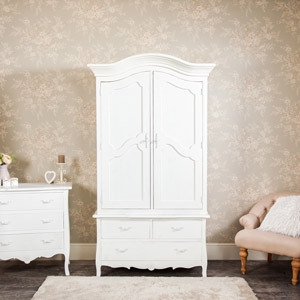 With a full bedroom set up in our Jolie range we can help you create your perfect French / Shabby Chic bedroom. This item doesn't require assembly. We have many products in our Jolie Range. 2-12 working days for mainland UK addresses.